Yahoo is making things more simple for you. You can now claim your Yahoo username, you wish to use. Many new changes and additional features are being added to Yahoo recently. You might have noticed, Tumblr is now a part of Yahoo and Flickr has increased the photo storage space with 1TB which is a huge amount of free storage. This time Yahoo is aiming its users to get a username according to their name like cyril@yahoo.com rather than cyril456@yahoo.com. Yahoo will be deleting the dormant accounts to help with new usernames. Yahoo has opened its registration to claim your username. You can add five usernames to the wish list. Once you have submitted five names of your choice, they will try to give the username according to priority. If any one from the top list username you submitted is free they will send a mail by mid-August as per the availability. Then you need to claim the username within 48 hrs. 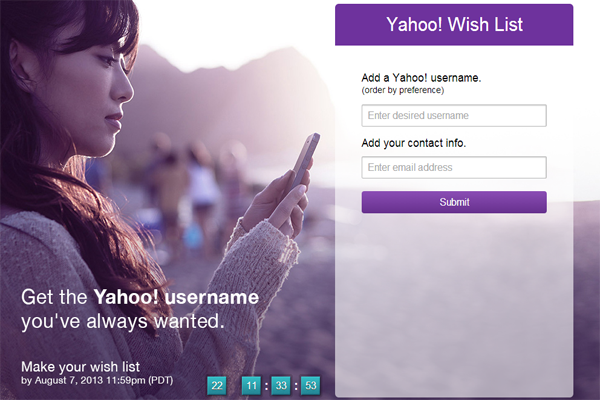 By getting a new username, you can avail all the services from Yahoo. « Top 30 Popular WordPress Plugins.